This is part three of our series that highlights names that rank below the Top 1000 in the US in 2015. That list is put together by the Social Security Administration every year based on the number of registered births throughout the country. 1. Maren (229 births in 2015 - #1114) Maren is the Danish form of Marina which comes from the Latin Marinus meaning "of the sea". In the US, Maren popped up on the record in 1916. This name was most popular in 1979 with 226 births and a rank of #733. It hit the #900s again in the mid 2000s, but currently ranks below the Top 1000 chart. Could this name ever catch on? 2. Opal (229 births in 2015 - #1115) An opal, of course, is an iridescent gemstone. It is the birthstone for the month of October. Originally, it comes from a Sanskrit word, upala, meaning "jewel". Opal peaked in popularity in 1918 then fell just as quickly back down the charts. It ranked in the Top 100 from 1905-1919, and then left the Top 1000 by 1961. This decade, Opal is inching upward. Could it make a comeback? 3. Fallon (225 births in 2015 - #1125) Fallon is an Anglicization of the Irish surname Ó Fallamhain meaning "descendant of Fallamhan", with Fallamhan meaning "leader". It's interesting to note that it was poorly used for boys and started out strong in 1981 for girls with 232 births for the year. The name was taken straight from pop-culture. It was the name of a popular female character on the soap opera Dynasty which started in 1981. It left the Top 1000 in 1996. Could it return or does Jimmy Fallon make it too masculine and/or surnamey? 4. Sally (221 births in 2015 - #1139) Sweet Sally is considered a diminutive of Sarah. Sarah is a Hebrew name that refers to a lady, princess or noblewoman. It is usually claimed as meaning "princess". As a standalone name, Sally does date back to 1880 when records began. It ranked the best from the 1930s to the 1960s, but it peaked in 1947 with 5,266 births for the year. It left the Top 1000 in the early 2003. Sadie is doing very well, another diminutive of Sarah. Could Sally climb the charts too? 5. Whitley (221 births in 2015- #1142) The meaning of Whitley isn't certain, but if you take a look at two other Old English names, Whitney and Wesley, you could surmise that Whitley means "white meadow". Whitley has been used minimally for boys over the years since 1914, but the females have received more usage even though it wasn't on record for them until 1984. Whitley did appear in the Top 1000 for girls from 1988-1993, ranking as high as #446 in 1988. 6. Marlowe (220 births in 2015 - #1146) Marlowe is a surname that is derived from the Old English place name meaning "remnants of a lake". Marlowe is a unisex name, having popped up for boys first in 1912. For girls it arrived in 1918 but it wasn't used as consistently. It gained more usage by 1967 and is now climbing the charts in the past decade. Both Marley and Harlow are in the Top 500 right now. Will Marlowe breach the Top 1000 soon? 7. Elodie (215 births in 2015 - #1167) The French Élodie comes from the name Alodia which is possibly derived from the Germanic elements alja meaning "foreign" and aud meaning "wealth". The fact that Elodie ranks down below the Top 1000 is somewhat surprising. It is one of those names often discussed around the baby naming community as suggestions. Perhaps parents aren't actually following that advice though. The name has almost always been used in the US but there were periods of time, like the 1970s-1980s, where the name was unheard of. This decade, it is gaining steam. Births per year more than doubled from 2007 to 2011, and nearly doubled again by 2015. Will she be popular soon? 8. Katrina (215 births in 2015 - 1168) Katrina is a variant of the Gaelic name Catriona which is a form of Katherine. That is said to come from the Greek Aikaterine, and it is said to mean "pure" but its origins aren't entirely clear. I detailed that in the past here. In the US, Katrina has been used since 1895. Its best year was 1980 with 3,397 births for the year. Despite being a beautiful name, Katrina may always be associated with the disastrous hurricane that hit the US in 2005. The number of births per year declined between 2005 and 2006, and the name left the Top 1000 by 2011. 9. Florence (214 births in 2015- 1173) Florence comes from the Latin feminine name Florentia, which came from the male Florentius and florens which means "flourishing". Florence is a city in Italy, and it was the name of a British nurse who founded modern nursing, Florence Nightingale. In the US, Florence ranked very well up until it began declining in usage in the 1960s. It was within the Top 10 and Top 100 for a very long time but it received the most births per year between 1915 and 1922. It left the Top 1000 in 1982. In just the last 4 years, Florence has gained some momentum. Will she be a Top 1000 name again soon? 10. Cecily (212 births in 2015 - #1182) While Cecily comes from the name Cecilia, Cecily was more common during the Middle Ages. Cecilia comes from the Roman family name Caecilius, which comes from the Latin caecus meaning "blind". Cecily was first used on record in 1911. It has remained below the Top 1000 the majority of the time except for once in 1974, and from 1988-1991. It's best year by far was 1989 when it hit #497 with 473 births for the year. It has fallen since then but could it rise again in the future? Which of these 10 names would you most like to see being commonly used on modern girls? Are you looking for a name that is not currently popular, but also isn't strange? You've come to the right place! Today we explore part three of our series that uncovers names barely being used for boys today. This list breaks into the #1100s, which indicates these names are way down below the Top 1000 most popular names in the country for 2015. Hollis (176 births - #1094) Since Hollis was derived from the Middle English word holis which refers to "holly trees", it was originally used as a surname by people who lived near such trees. Hollis had the most number of births in the year 1921 but left the Top 1000 in the 1970s. It is currently gaining a bit of popularity for both genders but it still ranks below the Top 1000 with 176 births for boys in 2015 and 106 for girls. Cormac (175 births - #1099) This Irish name may have been derived from the Irish Gaelic word corb meaning "raven" and mac meaning "son". There was even a King of Ireland in the 3rd century named Cormac. The Scottish equivalent is Cormag. This name wasn't used in the US until the late 1950s. It wasn't until the 1980s that it gained consistent usage year-over-year. It is climbing the charts now but still remains below the Top 1000. Dashiell (173 births - #1102) Dashiell's origins and meaning are relatively unknown. However, it is said to be an Anglicization of the French surname de Chiel. Dashiell popped up in the US in 1979 with 8 births on record. The name has never been in the Top 1000 but it is inching closer every year. Shepherd (173 births - #1108) As indicted, Shepherd is an Anglo-Saxon occupational name that refers to a "sheep herdsman". This name has been used on and off in the US records since about 1912. It wasn't consistent year-over-year until 1994. Its usage has begun increasing recently but not enough to score a spot in the Top 1000...yet. Brenton (169 births - #1120) Brenton comes from a surname taken from an English place name meaning "Bryni's town". In Old English, Bryni means "fire". This hot name is hardly being used in the US. It first appeared in 1912 and joined the Top 1000 from 1966-2013, aside from dipping below in 2010. Brenton ranked highest in 1984. Is this name on its way out or could it gain more usage again? Mordechai (167 births - #1133) Mordechai is the Hebrew spelling of the Persian Mordecai which means "servant of Marduk". The spelling Mordecai was the first to be used in the US, popping up in 1912, whereas Mordechai wasn't used until 1950. By the 1970s, Mordechai quickly became the more popular spelling. It even made it into the Top 1000 twice, once in 2003 and again in 2012. Could it ever have a long-term spot? Finnian (164 births - #1142) Finnian comes from finn meaning "white" in Old Irish. It was also the name of several Irish saints. The names Finn and Finnegan both rank in the Top 500, but their quirkier brother Finnian has yet to accomplish such feats. In the US, Finnian has only been used since 1993 on record. It is currently at a high point, but that still falls short of the charts. Could it be the next big thing? Lathan (164 births - #1144) Lathan is an unusual one. There doesn't seem to be a concrete origin for it. Many sites list it as a rhyming variant of Nathan, or maybe a form of Latham which is even rarer. In the US, it has been used on and off since 1912. Only in the last decade has it gained a bit of usage, even ranking in the Top 1000 from 2010-2011. It is down a bit since then. Will it ever gain traction? Kennedy (163 births - #1151) Kennedy is an Anglicization of an Irish surname. It comes from Ó Cinnéidigh which means "descendant of Cennétig". The name Cennétig means "armoured or misshapen head" and was the name of an Irish King. Kennedy is often given in honor of our late American President John F. Kennedy. It's also very popular for girls, ranking at #57 in 2015, even though it wasn't used for girls until the 1980s. For boys though, it was first used back in 1912, but it was never more popular than it was in 1964 when it ranked #516. It briefly ranked again from 1994-2005 at the bottom of the charts. Will this ever be popular for boys or is it too feminine now? Linus (161 births - #1156) The name Linus comes from the Greek name linos meaning "flax". In the legends, he was the son of the god Apollo. Linus was also the name of the 2nd pope. In the US, it dates back to 1882 but wasn't used regularly until 1909. Interestingly, it was never popular in the past. It is receiving more births per year now than ever before. Could it catch on for the first time ever? So which of these names do you like the most? Could you see any being catapulted to the top half of the charts in the near future? Or should these stay right where they are? Which would you use? 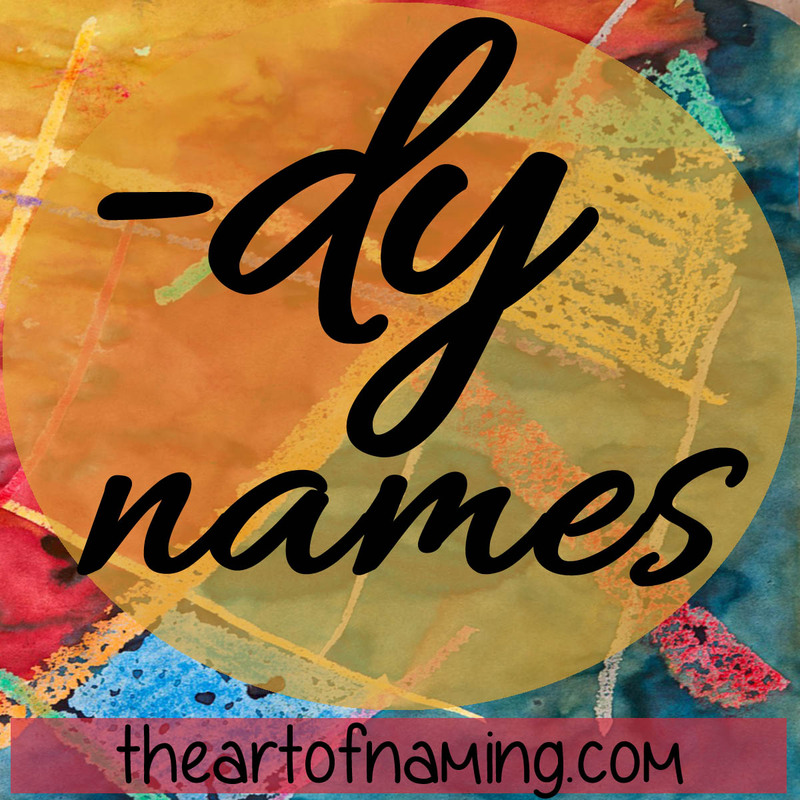 Taken straight from our list of names that end with the letters -dy, is the lovely Melody. This name is also an English word with which you're no doubt already familiar. 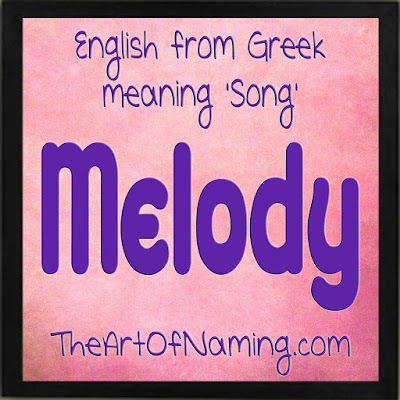 Melody is derived from the Greek melos meaning "song" and combined with aeido meaning "to sing", which forms the name Melodia. Via Late Latin and Old French, you get the name Mélodie. After that, it winds up as the English word and name Melody. Google defines it as "mel·o·dy -ˈmelədē. noun: a sequence of single notes that is musically satisfying." This musical name has been around in the US on record since 1914, but it wasn't until 1942 that the name arrived on the scene. It joined the Top 1000 in that year and continued to climb in popularity until it peaked in 1960 at #153 with 2,757 births. Its numbers declined a bit through the 1980s and 1990s, but since the start of the aughts, Melody has started climbing up the charts again. In 2015, there were 2,168 girls given that name for a popularity ranking of #148. Could this name continue to linger within the Top 200 or could it eventually break into the Top 100 for the first time? What do you think of Melody? Melody is a bit difficult to pair with. 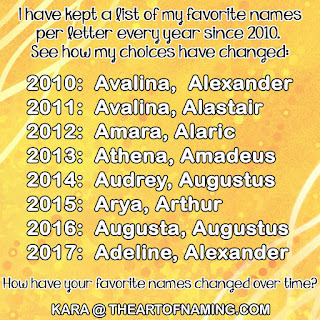 Which names would you choose? Names Ending with the Letters "-dy"
Up until now, we've discovered names ending with the letters -ay, -by and -cy. Now it is time to explore -dy ending names. It's sometimes difficult to do specific searches for names with specific criteria so I thought I'd compile some of the best -dy names that I could find. Can you think of any others? Do you spot any new favorites from this list? Would you use any? 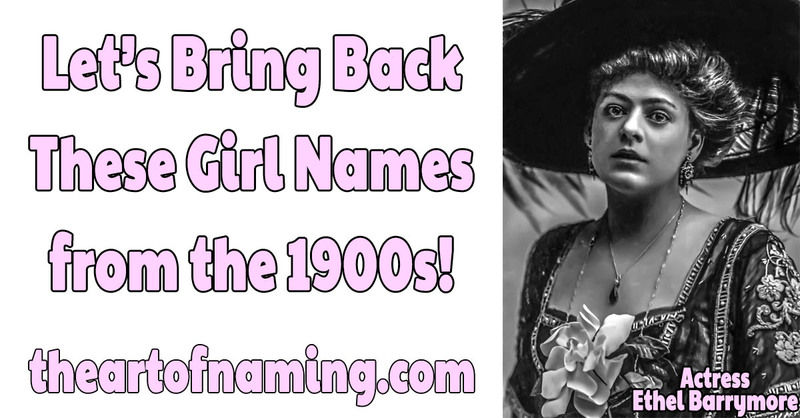 Shall We Bring Back These Girl Names from the 1900s? Welcome back to our "by decade" series that takes a hard look at the Top 200 combined names of a decade and compares it today's statistics. The Social Security Administration has an aspect of their site that combines the popularity of names between 1900-1909 and compiles it to make a Top 200 list. That's where I pulled this data. The rankings next to each name below is where that name ranked in the 1900s. I pulled out some of the best names from then that do not currently rank within 2015's Top 1000 list. In fact, each of these names are far, far below the Top 1000 chart. They were once decently used but their time has since passed. Could they ever receive a second chance? 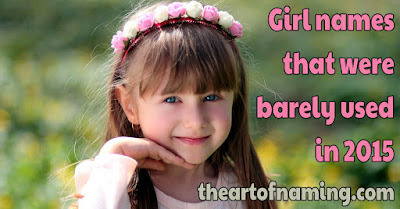 Would you ever consider any of the following names for a modern daughter? Did you know that Ethel is a sister name of Adele, Alina and Adelina? They all come from the Old English element æðel meaning "noble". Ethel was revived in the 19th century and has been used in the US since records began in 1880. In fact, it ranked very well way back then, hitting a high point in 1918 with over 8,000 births for the year. It left the Top 100 in 1939 and the Top 1000 by 1976. In 2015, there were only 12 Ethels born. Could this name ever again achieve the greatness it once knew? This name has one of two possible origins. It either came from the old Welsh name Gwladus, which may have been derived from gwlad meaning "country". But Gladys has also been used as the Welsh form of the name Claudia, which comes from the Latin claudus meaning "lame, crippled". Not the greatest meaning, but Gladys has been popular in Wales in the past. Here in the US, it ranked very well around 1915-1925. It hit a high of 8,819 births in 1920 alone. It started its decline through the 1940s-1960s, finally leaving the Top 1000 by 1998. Only 83 girls were named Gladys in 2015. Could this name be fashionable again or is it still very much a grandma name? Myrtle comes from the Greek μυρτος (myrtos) and is the name of an evergreen shrub. Nature and plant names are in style these days, but Myrtle has not been used much at all lately. It ranked consistently from 1880-1997 with a high point in 1918. Other than 6 births in 2005 and 9 in 2014, there were zero births on record after 1997. This name is currently not used, which is a shame. Myrtle would be very lovely on a modern girl. Will it ever come back? Thelma's meaning is not known but some have claimed that it is derived from the Greek θελημα (thelema) meaning "will", but it is not all that likely. Thelma became popular at the end of the 19th century after British author Marie Corelli used it as the name of the heroine in her 1887 novel "Thelma". It peaked between 1915-1925 in the US but it started declining gradually after that. It left the Top 1000 in 1983 and now only has 27 births as of 2015. Has Thelma had its time? Could this name rise again? 5. Dora (#85) Dora is a short form of the names Dorothy, Isidora, or Theodora. This is a case of "pick your own meaning". Both Dorothy and Theodora mean "gift of god", while Isidora means "gift of Isis", the Egyptian goddess. Dora ranked in the Top 100 from 1880-1909, but it received the most births per year in 1921 with 2,026. It declined in usage and dropped out of the Top 1000 in 1993. 6. Inez (#104) Inez is a form of the Spanish Inés which comes from Agnes. Agnes is Latinized from the Greek names Hagne and hagnos meaning "chaste". Later the name was associated with the Latin agnus meaning "lamb". In use in the US since 1880 on record, Inez had the most births in a year in 1920 with 2,107 girls given the name. It declined after that and left the Top 1000 altogether by the mid-1970s. Could Inez or Agnes reclaim a place on the charts in the near future? 7. Jean (#109) Jean is the Medieval English variant of Jehanne, from which Jane also derives. Ultimately, it is a feminine form of John which comes from the Greek Ioannes and the Greek Yochanan meaning "YAHWEH is gracious". Jane was common in England and Scotland in the Middle Ages before becoming rare up until the 19th century. Jean was in the Top 100 from 1907-1963. It saw the most births in 1927. It declined after that, leaving the Top 1000 in 1995. It may be used more often as a middle name these days. 8. Alberta (#116) Alberta is the feminine form of Albert which is derived from the Germanic name Adalbert from the elements adal meaning "noble" and beraht meaning "bright". Alberta was the name of one of Queen Victoria's daughters and it was for her that the Canadian province was named. While this name has always been used, it's become very rare. It fared the best in 1919 with 2,017 births for the year, but Alberta left the Top 1000 by 1971, dwindling down to a mere 9 births in 2015. 9. Goldie (#125) Goldie may simply come from a nickname for someone with golden hair but it is also a variant of the name Golda which means "gold" in Yiddish. Goldie has been around since records started in 1880 in the US, briefly doing its best from 1915-1918. She was quick to decline in popularity, leaving the Top 1000 by 1959. There has been a slight uptick in girls named Goldie in the past couple years; there were 79 born in 2015. Will Goldie resurface? 10. Alta (#170) It is possible that the name Alta is derived from either the Latin altus or the Italian and Spanish word alto, all of which mean "high". Alto is a musical term that refers to the second highest part of a vocal range. Alta has been in use since 1880 in the US and hit a peak in 1918 with 820 births for the year. It dropped off the charts by 1957 and hasn't seen any increases since then. Should Alta get more love? Would you ever consider any of these now-rare names? They all ranked well back in the 1900s but they are overlooked today. Which name deserves to come back the most? 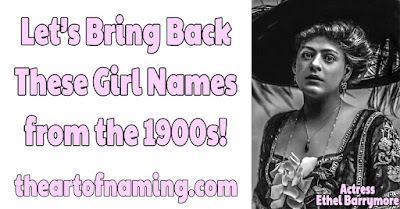 Let's Bring Back These Boy Names from the 1900s! This is the third article in this series that takes a look at faded names, one decade at a time. Today, we'll look at the names that ranked within a combined Top 200 from 1900-1909. This information is according to the Social Security Administration. The list that I used can be found here. First, I tossed out all of the names from that list that currently rank in 2015's Top 1000. While those are all great names too, we want to find the more obscure ones. The names on the list below are not often heard on modern boys, but that could change if any of these catch on again with parents. But it isn't always that easy. If a name is not fashionable or trendy enough, (or a family name), it may not stand much of a chance until those definitions of style change. Old names come back around all the time, so these could be favored again in the future, if not now. What do you think of them? Elmer isn't actually as fuddy as you'd think. It comes from the cool Old English name Æðelmær whose elements mean "noble" and "famous" from the German Adelmar with the same great meaning. Just Elmer, though, isn't quite as popular as it was back in 1918. In fact, once the 1940s ended, the name started going downhill. It hung around until dropping off the Top 1000 chart in 2008. Now in 2015, there were 148 boys with the name for a rank of #1223. This name is as straightforward as they come. Clifford refers to a "ford by a cliff". It is that place name that later became a surname, then a given name; all in Old English. It has always been on record in the US since 1880 and was used most between 1915 and 1964. It started declining in the 1990s and dropped out of the Top 1000 in 2006. It ranks down at #1241 in 2015 with only 145 births for the year. Could it rise again or is it too "big red dog" for modern boys? 3. Milton (#89): This is another straightforward surname derived from a place name. Milton means "mill town" in Old English. It has been used in the US since records began in 1880. Right around 1912, this name gained popularity until it peaked in 1920 with 2,592 births for the year. It remained well-used through the 1960s but gradually declined until it left the Top 1000 in 2009. Now it ranks at #1205 in 2015, which accounts for 152 births. Does Milton feel a bit too dated to be fashionable right now? If so, do you see it coming back in the future? 4. Willard (#119): Willard is an English surname that comes from the Germanic name Willihard and the Old English Wilheard. Willihard is taken from the elements wil meaning "will, desire" and hard meaning "brave, hardy". In the US, the name has been around since 1880 on record. It had a particularly impressive peak of popularity in 1915 when it rapidly climbed to #58 with 2,889. It continued to rank well through the 1950s, but slowly lost popularity. It left the Top 1000 in 1990 and has only continued to fall since then. Only 44 boys were named Willard in 2015. With William ranking so high, why doesn't Willard get more love? 5. 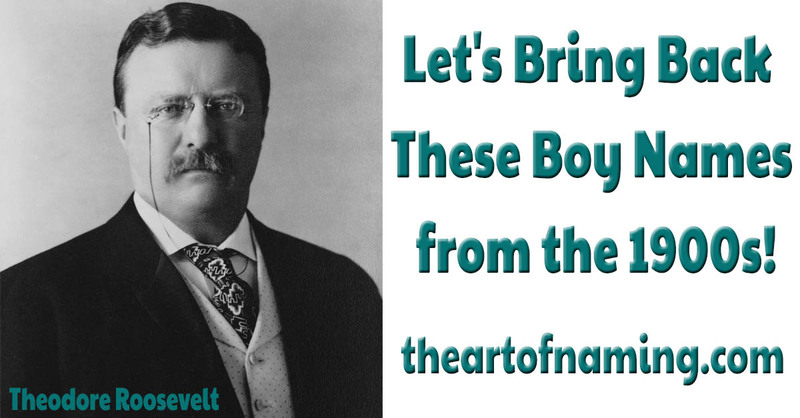 Roosevelt (#121): Roosevelt comes from a Dutch surname that means "rose field". This was the surname of two American presidents. As depicted in our photograph above, Theodore Roosevelt (1858-1919), and Franklin D. Roosevelt (1882-1945). It may be a Dutch name, but it feels strongly American. The name was at its peak in 1933 and remained in the Top 1000 until 1994. 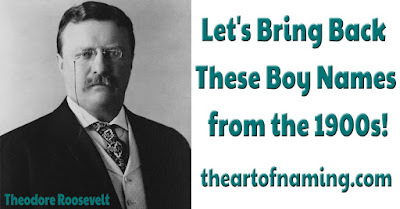 Only 50 boys received the name Roosevelt in 2015. 6. Rufus (#140): This Latin name means "red-haired" and belonged to several saints. It was occasionally used as a nickname on redheads, including a king of England named William II. It has always ranked in the US since 1880, doing fairly well, especially through the 1920s. It remained in the Top 1000 until 1989. 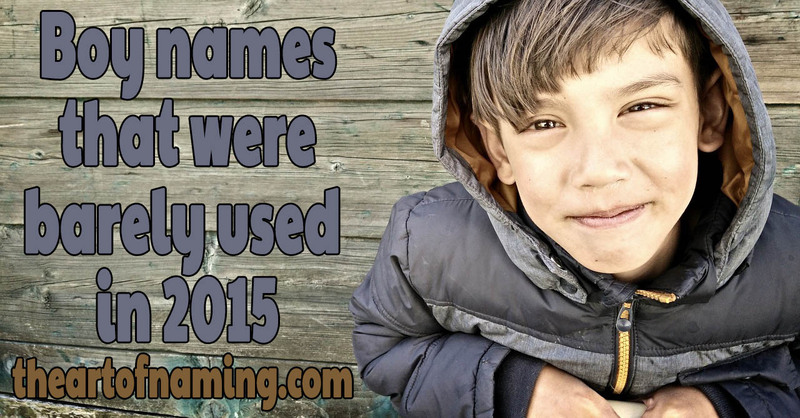 Only 43 boys were named Rufus in 2015. Could it work on a modern boy? 7. Arnold (#141): Arnold is a German name derived from arn meaning "eagle" and wald meaning "power". It replaced the Old English name Earnweald after being introduced to England by the Normans. It lost usage after the Middle Ages until the 19th century. It has been used in the US since 1880 on record, even landing in the Top 100 between 1912 and 1931. By 2005, it left the Top 1000, and had only 95 births in 2015. Could it be more common in the future? 8. Orville (#149): It's possible that this name was meant to mean "golden city". It appears to have been invented by an 18th century writer named Fanny Burney. It was made familiar by airplane-inventor Orville Wright. The name has been around since 1880 when records started. It saw its highest level of popularity from 1914 through the 1920s. It left the Top 1000 in the mid 1970s. Now it is down to 12 births a year in 2015. Will it ever be common? 9. Alton (#177): This Old English name comes from a surname that was based on a place name meaning "town at the source of a river". Alton has ranked rather well since 1880, with its best year being 1928. It very gradually lost steam and dropped out of the Top 1000 in 1999. Could it be in line with modern trends again in the near future? 10. Roscoe (#199): Roscoe comes from an English surname that derived from an Old Norse place name meaning "doe wood". Roscoe was most popular in 1920, but it ranked within the Top 1000 from 1880 to 1975. After that, it declined in usage and currently earned 71 births for the year 2015. Is Roscoe potentially stylish enough to come back in the future? Now that you've browsed through the ten names here, which do you like the most? Which do you think stands the best chance of revival? Which will never see the Top 1000 any time soon?